Chris Hughton said he will have no difficulty in lifting his Brighton players for their crucial match against fellow strugglers Cardiff on Tuesday night. The Seagulls welcome Neil Warnock's side to the Amex Stadium knowing a win would all but seal their Premier League safety and condemn Cardiff to an immediate return to the Championship. 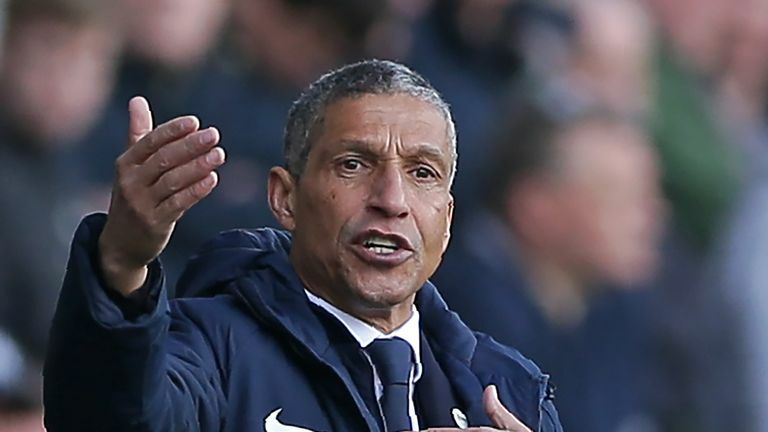 Hughton described Saturday's 5-0 home defeat to Bournemouth as Brighton's worst performance of the season, but insisted that motivating his players will not be an issue. "There won't be any difficulty in lifting the players," said Hughton. "They'll want to prove a point on Tuesday, they'll want to show an attitude that they were disappointed with Saturday. "The only way to turn it around and get the result you want is working as hard as you can and applying yourself as hard as you can. "It's always about how you respond. You respond because you're a professional and because you don't have a choice - this is the game, the ups and downs of the game. With a five-point cushion and a game in hand over Cardiff, Brighton certainly have the advantage, but a worrying run of three straight defeats has left Hughton looking over his shoulder. The Brighton boss pointed to playing in a difficult league and not managing to score enough goals as reasons for his side's struggles, but refused to look for excuses. "I don't think you can look at excuses, there are always other teams who have been through something similar," Hughton said. "There will never be any excuses here. "If we are on our game, performing well, we have every chance. "We are not so far away from being on the back of a good result here against Huddersfield, a good performance at Palace, at Wembley a week or so ago. "The good thing about our game is you always get an opportunity and on this occasion it's a very quick opportunity to turn things around."